Good Saturday Morning to you all! I know it is rainy and damp out there today. But remember rain makes our lawns, plants and gardens grow! So bring on the rain! The wet weather also has me shifting in to “indoor” gear a bit and getting caught up with these notes that I have come to enjoy. Crabgrass thrives anywhere that there is bare soil, water, and sunlight. Though it isn’t usually an obvious problem until around the 4th of July (I can mark my calendar by it!) Crabgrass can germinate as early as April and continues to grow all summer. From mid-summer to fall, crabgrass produces seed. The crabgrass plants (but not the seeds) are killed by frosts in autumn. HOW CAN I PREVENT CRABGRASS FROM GROWING IN MY LAWN? There are several ways to prevent or at least reduce the likelihood of crabgrass rearing its ugly head. One of the ways to combat crabgrass is through the timely application of a crabgrass pre-emergent. Preemergent herbicides (also spelled “pre-emergent”) come in either granular or liquid form. They kill crabgrass seedlings as they germinate by creating a barrier on the soil that the roots of the young crabgrass plants cannot penetrate which in turn prevents them from developing further. I would like to mention here that many gardeners/landscapers will say that a lawn should not be aerated after this treatment has been applied as it will disturb that barrier and allow crabgrass to grow. Remember crabgrass needs heat, light and water to germinate. Light and heat do not reach into the small holes left by aeration. So after nearly 25 years in this profession it is my opinion that it is just fine to aerate after that treatment. However dethatching will destroy that barrier and should not be done until later in the season. WHEN SHOULD I APPLY THIS PREEMERGENT? For success in getting rid of crabgrass in this manner, timing is very important. Preemergent herbicides should be applied before germination, but not too far ahead. Crabgrass germination coincides approximately with the blooming of the lilac bushes. Thus the old saying that preemergent herbicides should be applied sometime between the time the forsythia bushes (which precede the lilacs by a few weeks) stop blooming and the lilac bushes begin blooming is especially noteworthy. WHAT SHOULD I USE TO PREVENT CRABGRASS? Dimension (active ingredient, dithiopyr) is the most popular preemergent product on the market these days. It is readily available in most garden centers and those “box” stores. It can be purchased as a combination product with fertilizer (step 1), or as a standalone product that is applied separately from fertilizers. Dimension is safe to use on most lawn grasses (check label first) and provides long-lasting coverage. Dimension also works as a post emergent. This is an important consideration, since not all crabgrass seed germinates at once. So Dimension will kill later-germinating crabgrass, too. WHAT ELSE CAN I DO TO PREVENT CRABGRASS? Irrigate afterwards: water activates preemergent herbicides. Re-apply preemergent herbicides, if you question your product’s coverage. Because crabgrass seedlings do not all germinate at once, re-application can kill some of the later-germinating crabgrass. Follow label directions and apply the proper rate. Measure the lawn area and calibrate your spreader carefully. Fertilize your lawn properly and on schedule. 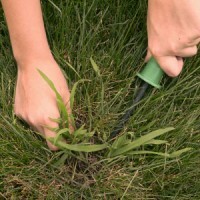 A vigorously growing lawn that is well watered and mowed properly is the best defense against all weeds! Don’t let bare spots remain uncovered for long, else opportunistic crabgrass will take root. In the fall, fill in those bare spots by overseeding. When irrigating the lawn, water more deeply and less frequently. Crabgrass is a notoriously shallow weed. One of the most important tips on mowing lawns that I can offer as it relates to weed control is to “mow “high.” This means leaving the lawn grass at a height of 2 1/2″-3″. Doing so will allow the lawn grass to “protect its own turf” better, depriving crabgrass seeds of the light they need to germinate. In closing, there are organic controls and many other methods of controlling crabgrass. I chose the above as it seems to be the most common and generally the easiest for your average, busy, do-it-yourselfer to work with. It is cleaner, non-staining and easier to apply than many other products on the market. Dimension herbicide is also the one used most commonly by the many lawn care companies in our area including my own. You can also e-mail me here or call 508-245-1777 for the fastest response. Best Cities for Urban Forests Caterpillar Time!